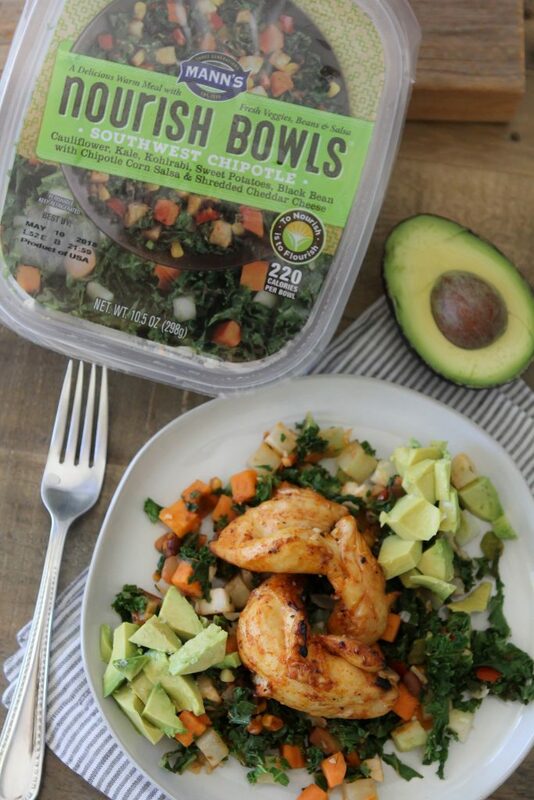 This Southwest Chipotle Nourish Bowl with Chicken is brought to you by The Whole Smiths and Mann’s Fresh Vegetables. It’s the perfect easy-to-make weekday meal for lunch at the office or dinner at home. If you’ve been following The Whole Smiths for any length of time you know I am passionate about making healthy, easy meals convenient for everybody. 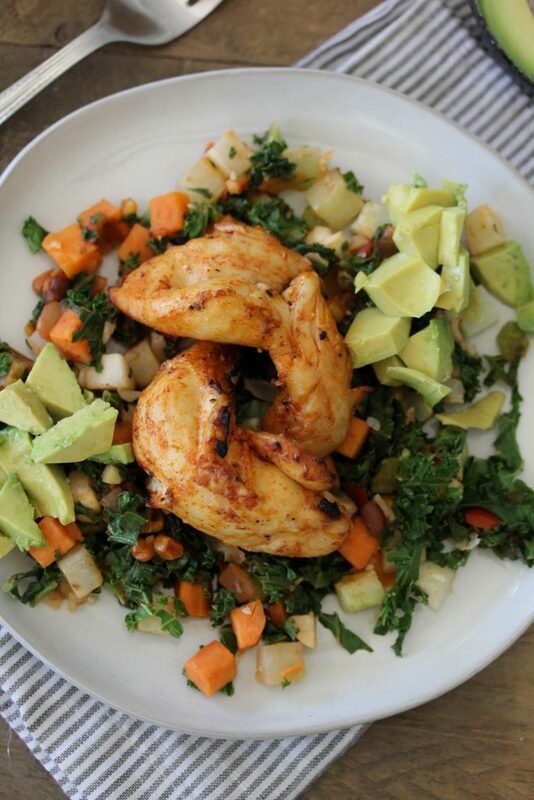 I don’t believe eating well needs to be a time consuming and expensive endeavor. I’m also a firm believer in letting others prep my veggies for me. Because who on Earth wants to do that themselves? 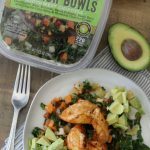 Therefore, when I was given the opportunity to create a recipe using one of Mann’s Fresh Vegetable’s Nourish Bowls I was game. While I’ve been buying their Nourish Bowls for awhile now, our local Costco recently started carrying them in two packs, which means that I’ve been eating them on a weekly basis now. 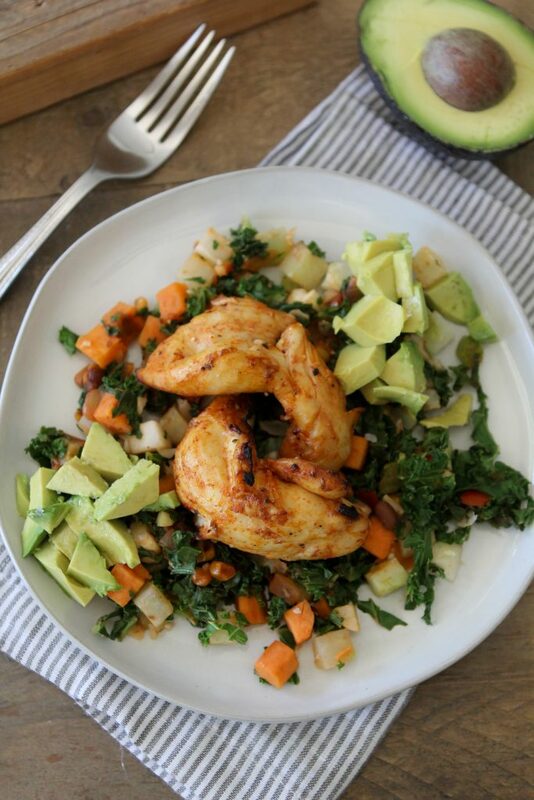 I love how easy it is to prep the bowls and serve up a health nutrient dense meal. 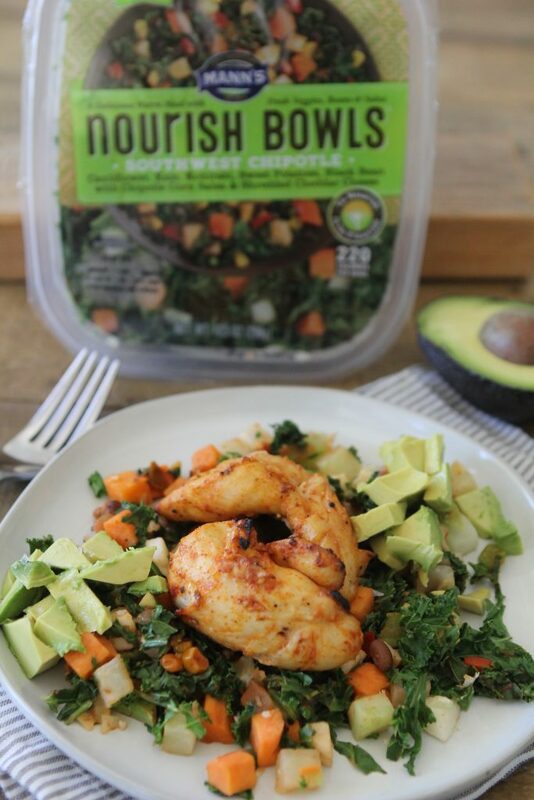 Mann’s Nourish Bowls come in a wide variety of flavors and you can check them all out here. While Nourish Bowls are great on their own I typically add a protein to them. Anything from rotisserie chicken to leftover salmon works fabulously. This time around however, I created some southwest-spiced chicken skewers to pair with it. To make these you can either fire up the grill or simply place them onto a broiler pan and boil them in the oven for a quick addition. Something I’ve come to realize and become passionate about the more I’m in this health and wellness space is that people need healthy to be convenient. In the 70’s we realized that people needed a convenience factor when it came to food but I think things got a little out of control with the arrival of heavily processed microwavable meals. But we loved the convenience of these packaged foods! I can only image the sigh of relief moms across the country let out when they were able to pop an entire meal into the microwave and serve it in about 3 minutes. Then came along the 80’s and its new low-fat, low-calorie craze. That combined with the convenience factor led us even further down the rabbit hole. No one was getting healthier, we just had easy access to lower quality foods. Fast forward to today, we’ve learned that our bodies need nutrient rich, real foods to function properly. But we all know that can take a lot of work to prepare on a regular basis. We still need the convince factor when it comes to preparing healthy meals. Which is precisely why I am loving what Mann’s Fresh Veggies doing with their products. Their pre-cut vegetables are a staple in our house. Now their Nourish Bowls have quickly become a go-to lunch solution for me. 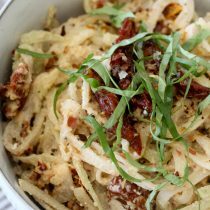 If you’d like to see how I use their Butternut Squash Rotini make sure to check out my Chipotle Lime Butternut Squash recipe. By taking out the preparation of your veggies and answering the question of what’s for dinner or lunch, we are finally getting a healthy, convenient, quick meal option. These chicken skewers are designed to be easily made. Whether you make them ahead of time to use through the week or right before you eat them, they take no time at all to prepare. And as far as the Nourish Bowl? All you need to do is pop it into the microwave for a few minutes, that’s it! So tell me, how do YOU keep a healthy lifestyle manageable and convenient? These little bowls are not only convenient but packs powerful punch of nutrients. 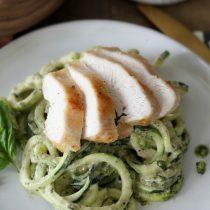 Great for lunches in the office or a quick dinner at home! Add the chicken breast tenderloins, olive oil, salt, smoked paprika, garlic powder and black pepper to a bowl and toss to coat the chicken evenly. Skewer the chicken onto a kebab skewer and place onto a broiler pan. Broil er the chicken on each side for minutes. While the chicken is broiling, prepare the Nourish Bowl accord to manufacturer's instructions.